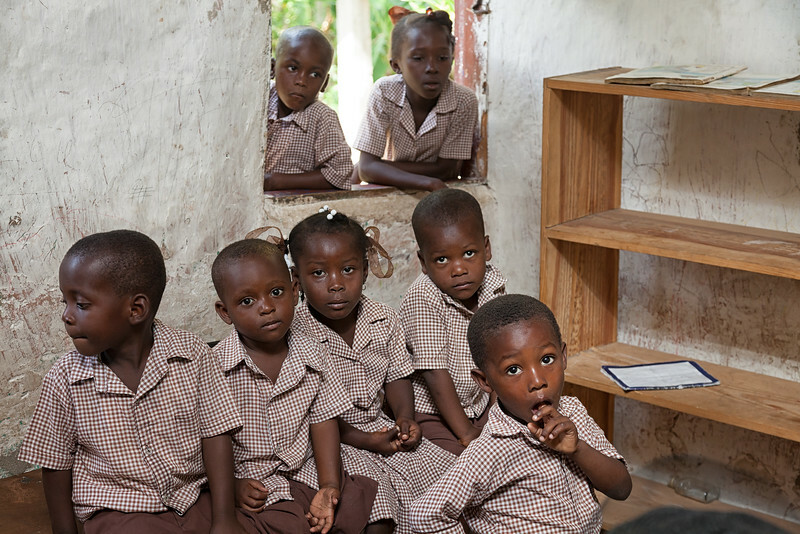 The Good Samaritan Foundation of Haiti runs a school in the village of La Hatte. 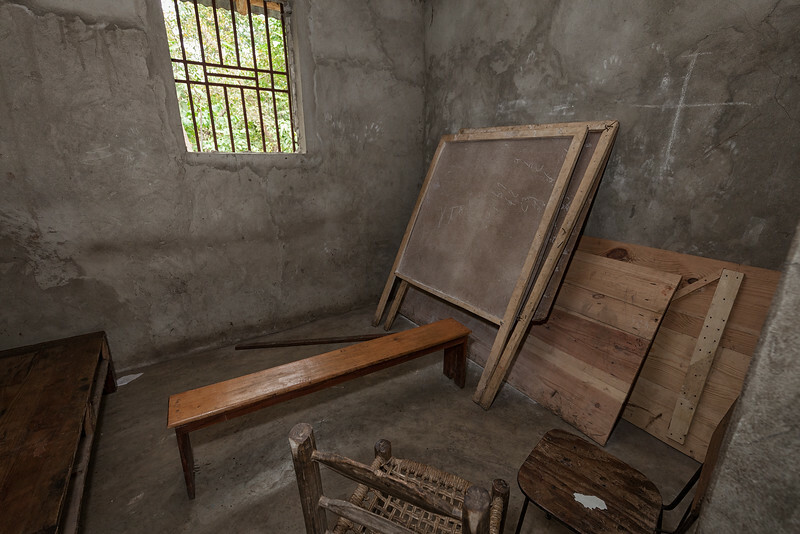 It was illegally occupied by someone who had locked up all of the rooms and the school had been using a temporary location. Here you'll find some photos of the temporary school and our work "taking back" the permanent school! Photos are in no particular order. 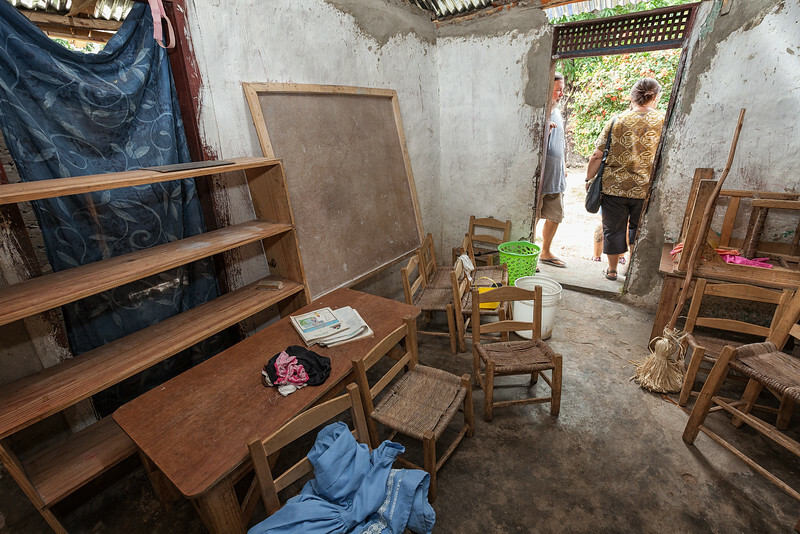 This is the tiny room currently being used as a kindergarten until the main school in La Hatte is operational. 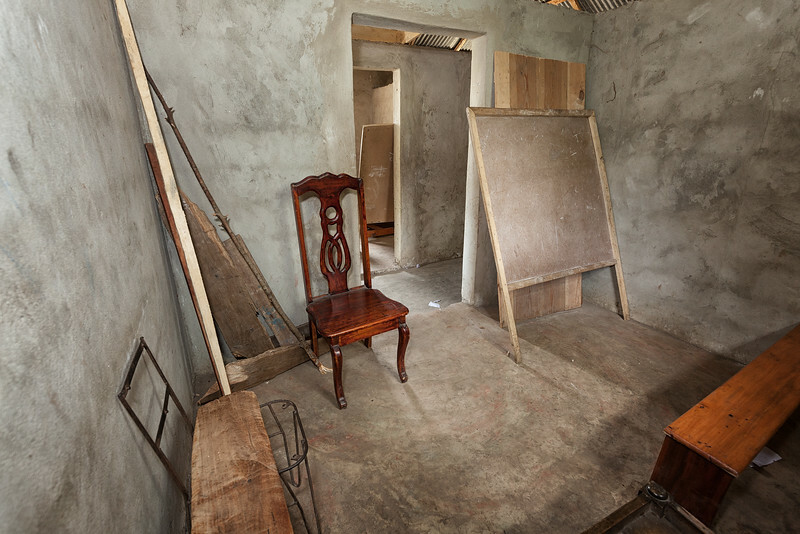 This small room holds 25 students and was originally built as a large family home. 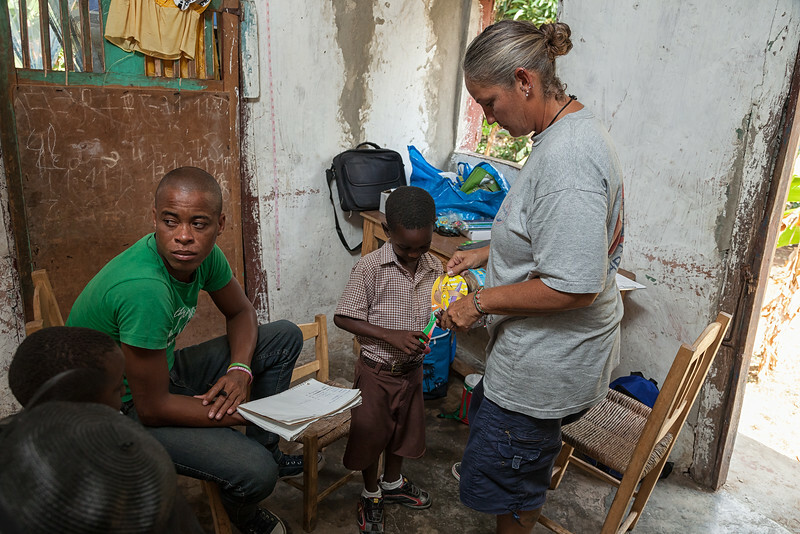 Mandy and Bienamié inspect one of the tiny rooms currently being used as a classroom until the main school in La Hatte becomes operational. 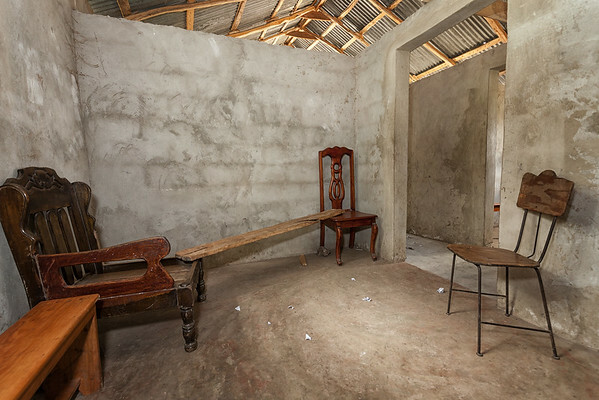 Another tiny classroom used to teach 25 students until the main school in La Hatte becomes operational. Using a plank to increase the seating capacity of this small classroom in La Hatte. 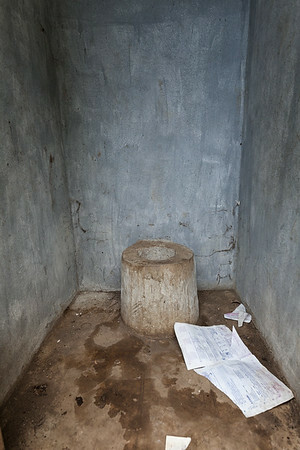 One of the latrines at the school in La Hatte, in desperate need of cleaning. 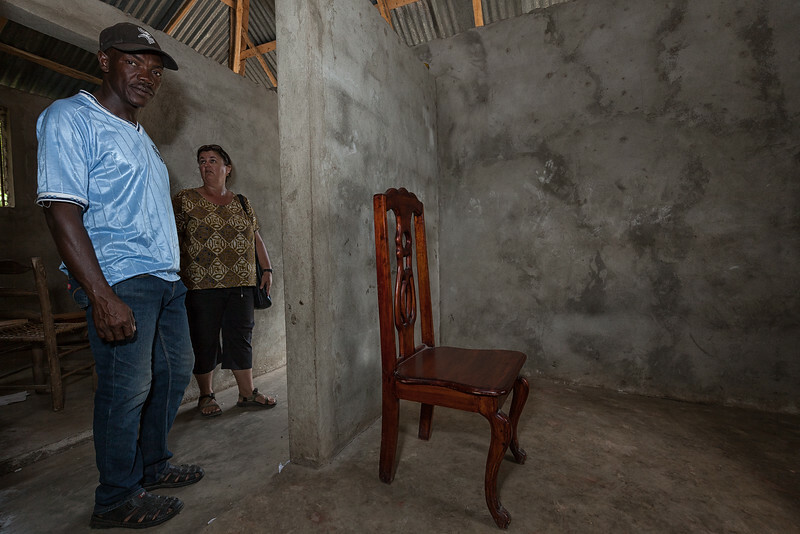 Latrines & toilets are a rare find on Ile A Vache. 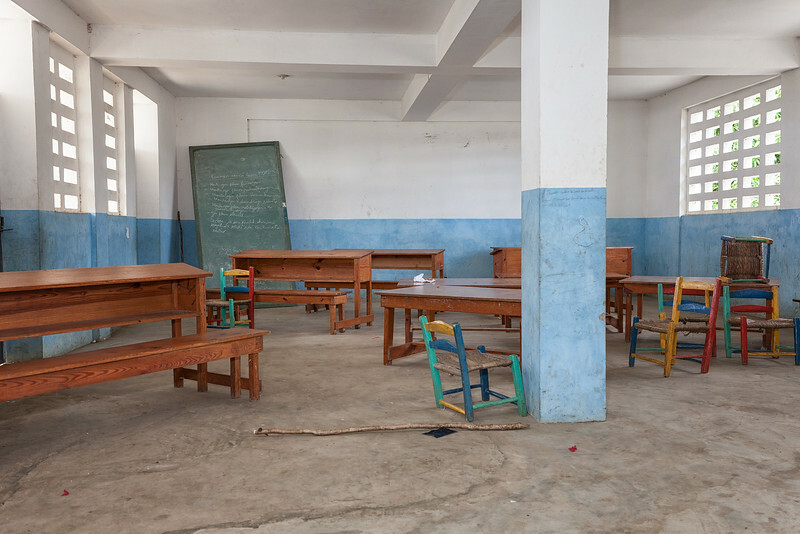 The large empty classroom of the new school in La Hatte. 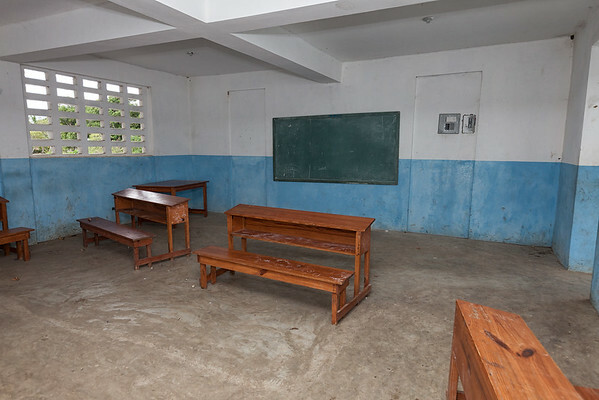 One of the large classrooms of the new school in La Hatte, currently abandoned. 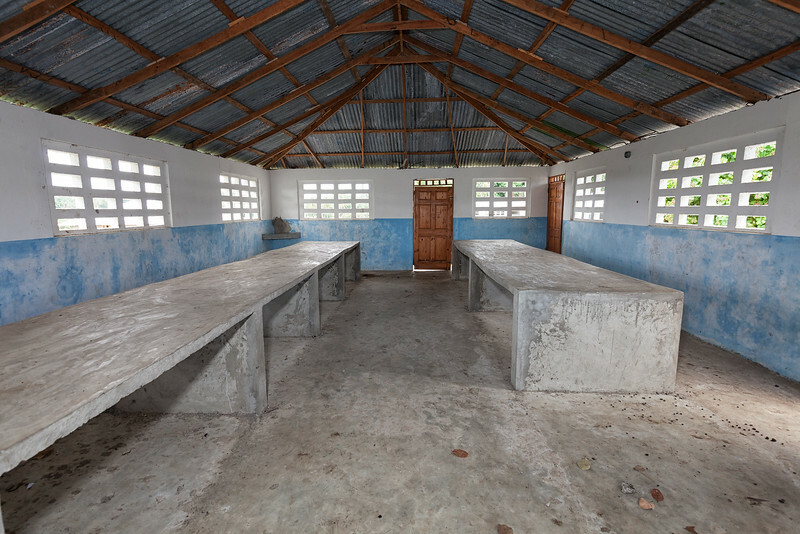 Concrete slabs make up the tables of the dining hall of the school in La Hatte. Teachers passing out report cards at the site of the temporary school in La Hatte. 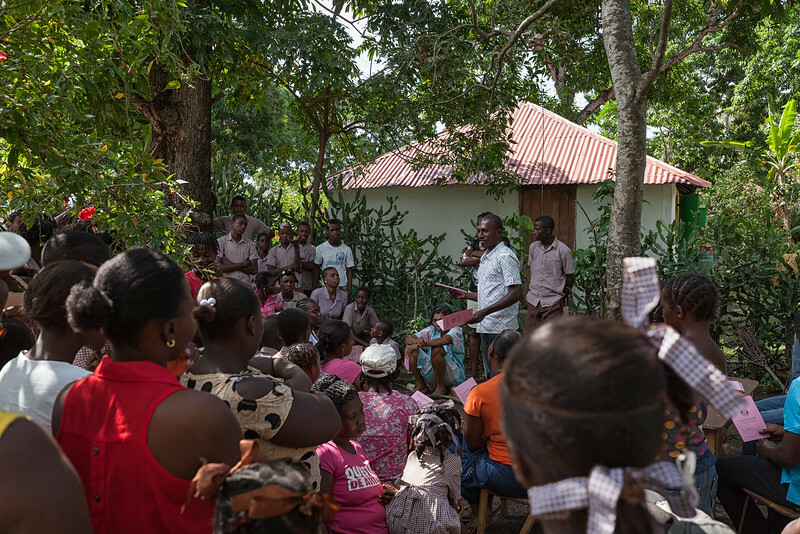 Parents get to see their childrens' progress during distribution of report cards at the temporary school in La Hatte. 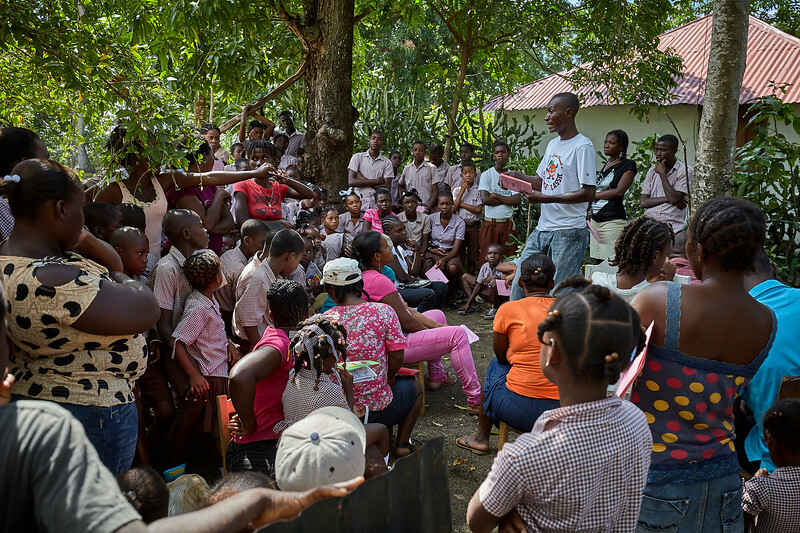 Chilren watch and wait their turn during the health assessment at the temporary school in La Hatte. Children come in for their health assessment and are asked how old they are, how many siblings they have, and if they have both parents. Many of them couldn't answer. Children watch Emily input data into the computer during the health assessment at the temporary school. 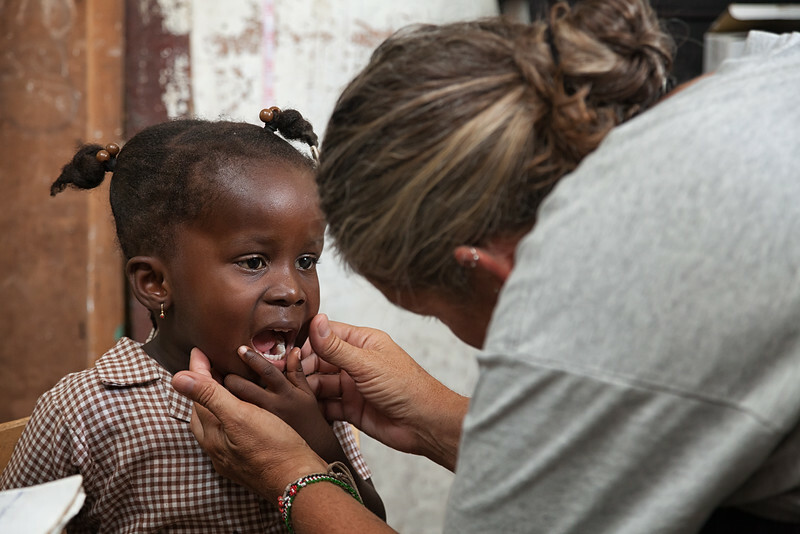 Emily inspects teeth during the health assessment. 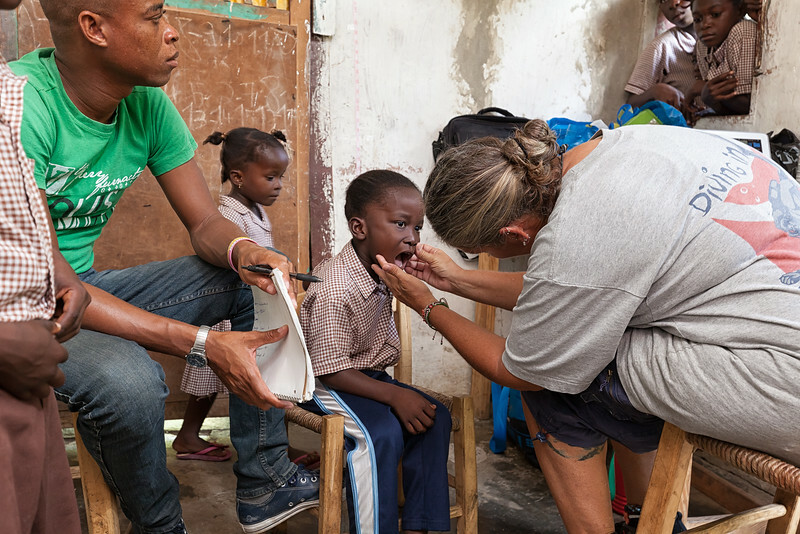 There is no dental care on the island. 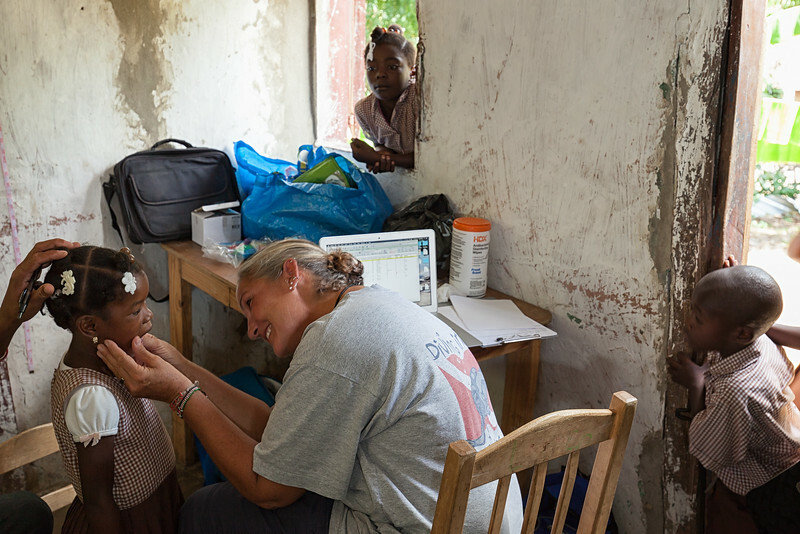 A lot of people on the island have dental problems, so Emily does a quick assessment of their condition. 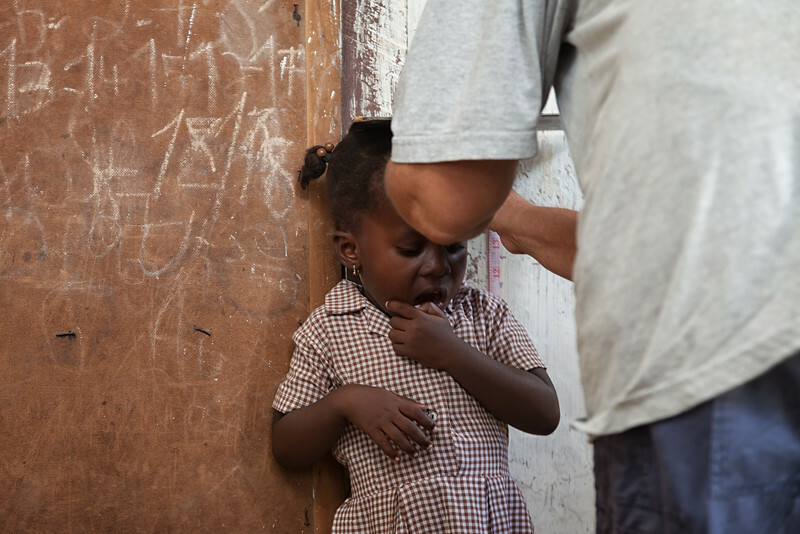 Many of the children are shorter than average due to malnourishment and other factors. 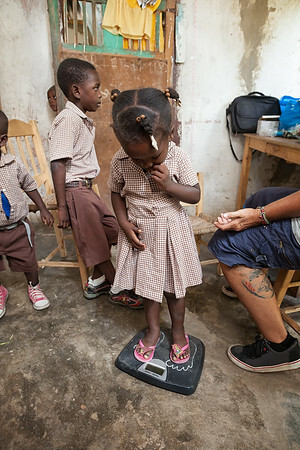 Children are weighed as a part of the health assessment at the temporary school in La Hatte. 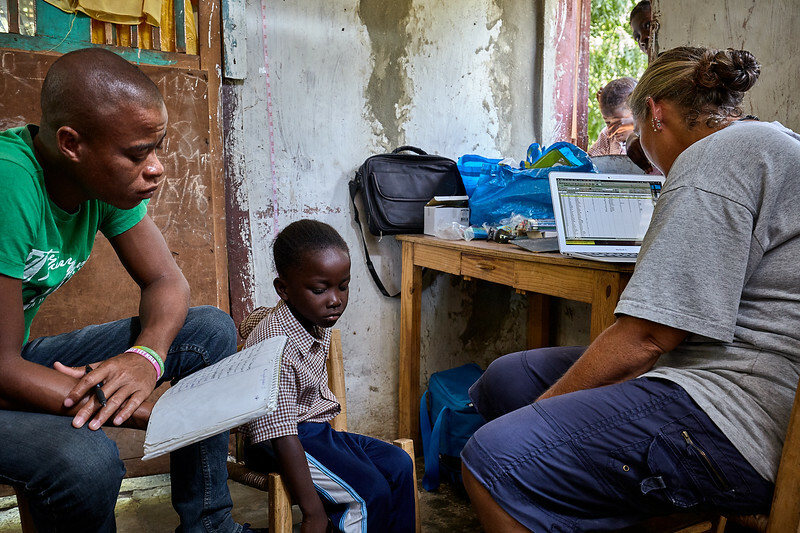 Children wait their turn for their health assessment. 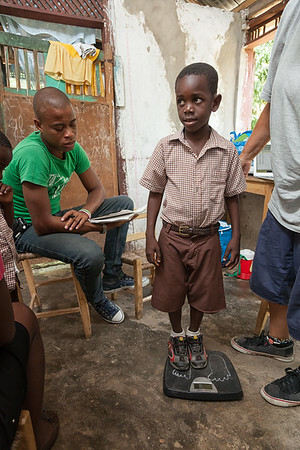 Many of the boys on the island are shorter and skinnier than they should be for their age. Emily hands out toys after the two-minute health exam. 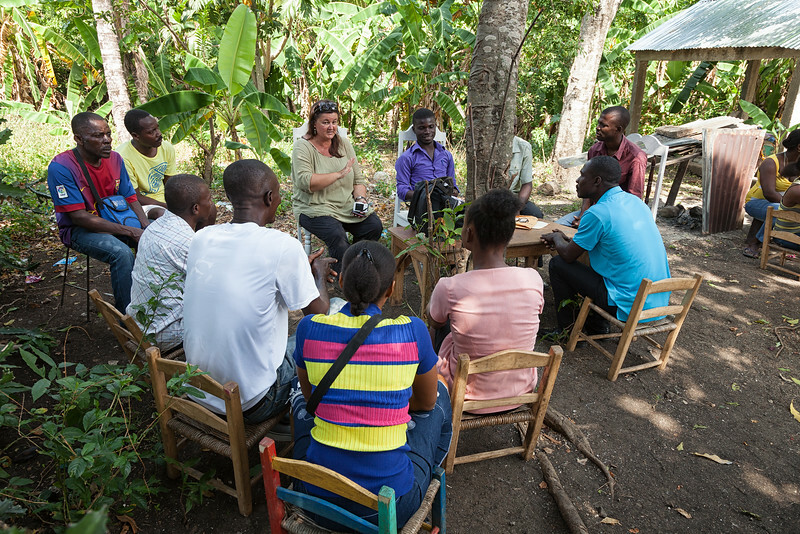 Mandy meets with the teachers at the temporary school, discussing plans to take back the school that was originally built for them. 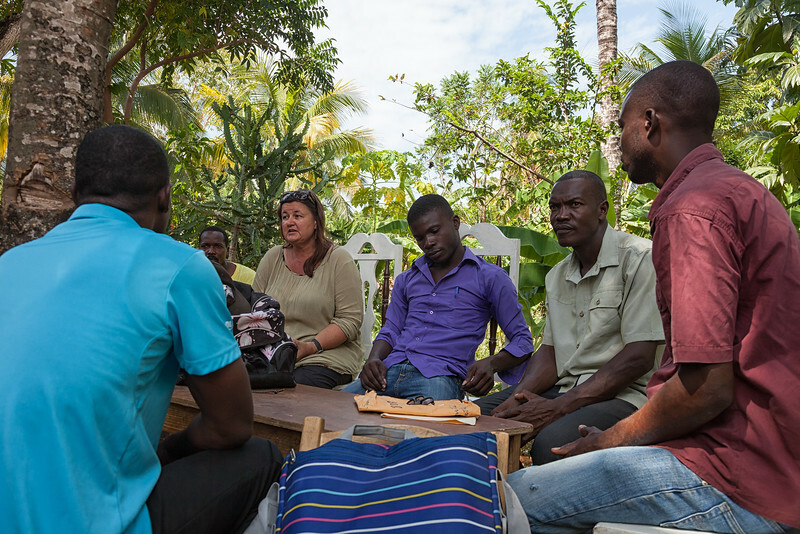 Mandy and Bienamié, the school superintendent (2nd from right), discuss the next steps for the school with the teachers. 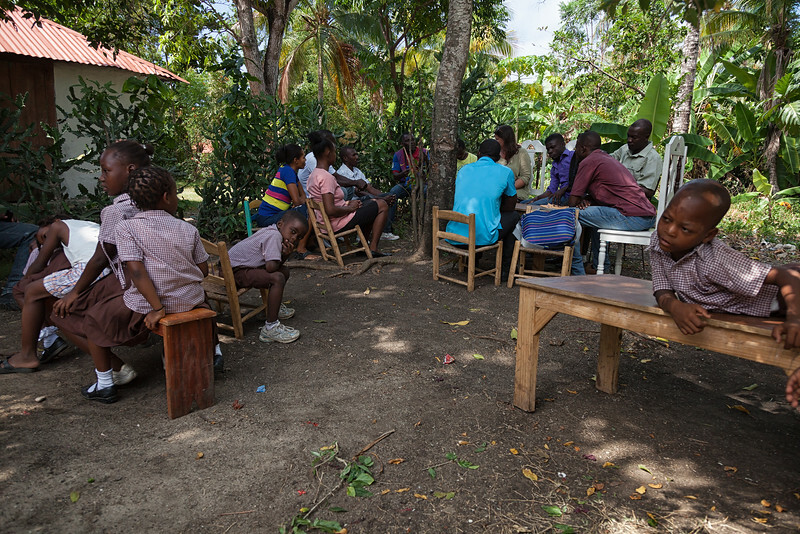 Children loiter after report cards were passed out, while Mandy meets with the teachers.